From right to left. Canadian Halifax Class Frigate HMCS Regina, American Oliver Hazard Perry Class Frigates, USS CURTZ and USS INGRAHAM, Canadian Iroquois Class Destroyer HMCS Algonquin and the American Arleigh Burke Class Destroyer, USS SHOUP patrol the area off the west coast of Vancouver Island May 9 2007. 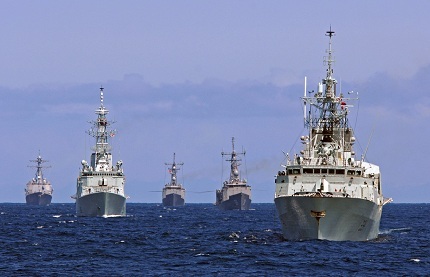 These five ships along with Canadian Frigate HMCS Ottawa and the refuelling ship, USNS JOHN ERICSSON, are part of a coalition force participating in Exercise TRIDENT FURY 2007.